wanderlust ATLANTA: Miss Star Trek Universe Goes to the Romulans! There would have been many disappointed Ferengi at this year's Miss Star Trek Universe Pageant...there were several contenders any of who could have taken the crown. Fortunately for one Romulan in particular, there wasn't a cloaking device in sight! Her (seemingly) Irish jig was seen by everyone! The competition, immediately preceded by a Klingon-led series of games (I think he'd been nipping the blood wine), was fierce. Many of the contestants had obviously worked on their uniforms and routines for many, many months—if not the entire year—and others were solely relying on their womanly ways and lots of skin! Each and every person who took to the stage—as well as all the folks behind-the-scenes—deserve a standing ovation for putting on a fantastic performance! This is one session that I always attend and will wait in line for an unrealistic measure of time to get a great seat! 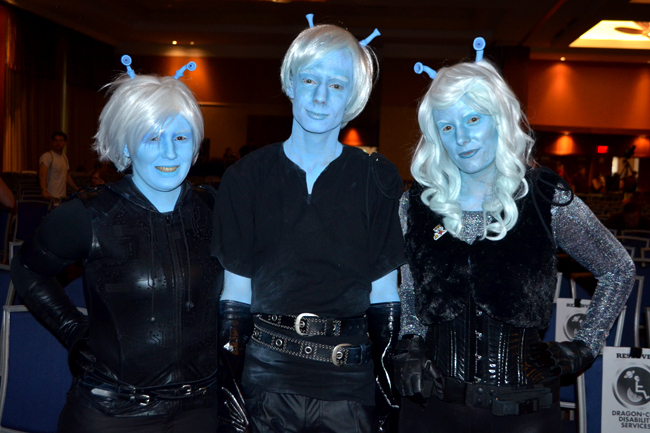 This trio of Andorians graciously served as stage hands during the pre-show act...well, they got to light into gamers with Bat'leths, so it couldn't have been too horrible. They were pretty damned good, actually. 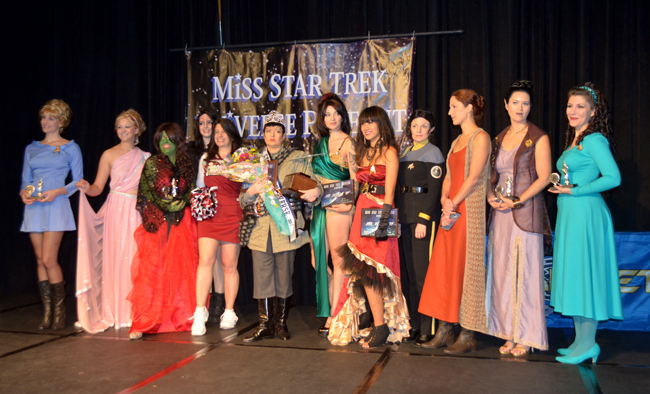 No, Scotty was not a contestant at this year's Miss Star Trek Universe Pageant...I can't believe you'd ask that! 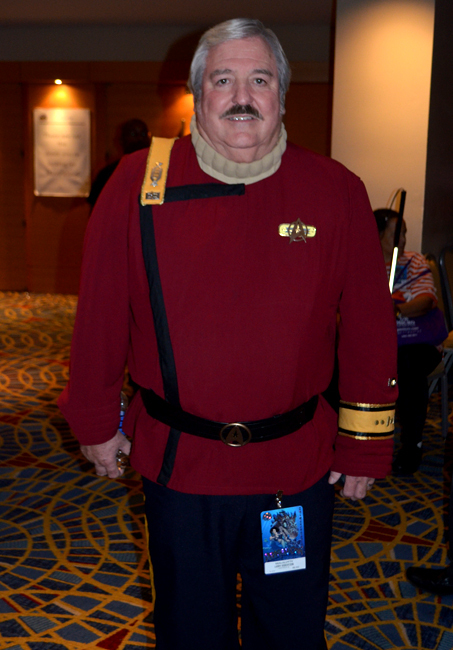 Actually, this event brings probably the largest number of Star Trek costumes of the Con, so it's a fantastic time to snap a few shots of Starfleet officers and others from around the known Universe. This year's distinguished panel of judges included a very special local guest...Emily Cook, Miss Georgia 2009. She graciously posed for photos after the Pageant when I learned that you can't just give your camera to someone else who is holding a camera and assume they know how to use it. Fortunately, Emily looks gorgeous in the Star Trek dress that her mother made for her. Both her parents were at the Con. Garrett Wang, the Trek Track Chair and Harry Kim from Star Trek: Voyager, told us that he'd been trying to get her to the Pageant since he first took over the Track in 2010. He and everyone else there was grateful for her participation...especially a few guys probably could have used a whiff or two of oxygen. Also on the judges panel were Dominic Keating, Cirroc Lofton, and Terry Farrell. 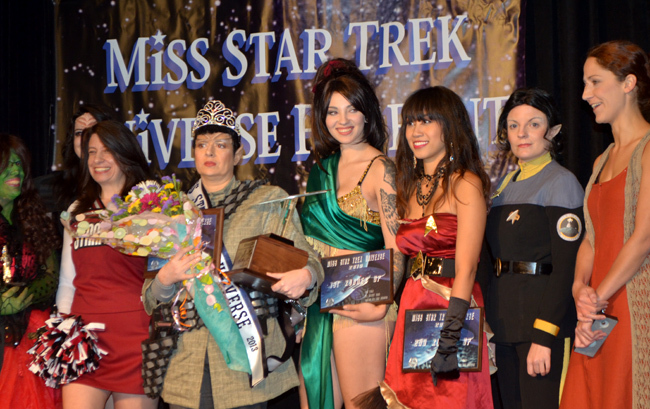 All in all, it was another brilliant Miss Star Trek Universe Pageant! Looking forward to the next one! Do we have to wait a whole year?